It is very difficult to find the best tourist destination in any country or city. But do not worry, we are here to tell you about the top 10 tourist destinations in Spain. vacation in Spain. Its continental territory limits to the south and the east with the Mediterranean Sea except for a small terrestrial border with the British territory of Gibraltar; To the north with France, Andorra and the Bay of Biscay; And to the northwest and west with the Atlantic Ocean and Portugal. The Royal Palace of Madrid is the official residence of the King of Spain although it is only used for ceremonies of the state. The palace is partially open to the public, except when it is used for official affairs. King Juan Carlos and the Royal Family do not live in this palace, but in the more modest Palace of the Zarzuela on the outskirts of Madrid. The Royal Palace is one of the tourist destinations of Spain, built between 1738 and 1755, and King Carlos III lived in this palace in 1764. Ronda is located 100 kilometers west of the city of Malaga. Its population is approximately 35,000 inhabitants. This small village stands on a huge cliff and has a magnificent bridge that crosses a gorge between old and new Ronda. It is a beautiful place to visit since it has the oldest ring of bulls in Spain and Roman baths. You will be surprised to find a museum by artist Salvador Dalí in his hometown of Figueres in Catalonia, Spain. Salvador Dalí is one of the most beloved painters in the world. It is a beautiful and historic place. It is one of the most prominent places in the north of Spain and one of the tourist destinations. Las Ramblas has one of the most popular markets in the world. It is a street in the central area of ​​Barcelona, ​​Spain. Las Ramblas is just pedestrianized and offers markets, shops, cafes and outdoor restaurants. You can find everything in this street market. You can spend all day walking and looking for hidden treasures and trying the good cuisine that Spain offers. It is a really interesting place to visit in Spain. La Concha is one of the most beautiful islands for vacations. La Concha in San Sebastián is said to be one of the best beach towns in Europe. It is one of the most visited islands in Spain. Here you can surf, walk along the promenade in search of good restaurants and enjoy the beautiful views of the beach. You will never forget the day you spent on this beautiful island. The Mezquita of Cordoba is one of the fascinating buildings famous for the forest of pillars and arches inside the main hall. It is located in the Andalusian city of Cordoba, Spain. It was originally a Roman temple, then a Visigothic church before the Umayyad Mosques built the Mosque. After the Spanish Reconquest, a cathedral was built in the center of the large Moro building. It is a beautiful building to visit. The Guggenheim Museum is the fourth best and most beautiful place to visit. It is located in Bilbao, Basque Country, Spain. The Guggenheim Museum is modern and contemporary art. It opened in October 1997 and is considered one of the most significant architectural structures of the 20th century. The Sagrada Familia is a large Roman Catholic church located in Barcelona, ​​Spain. You will be surprised to know that this is one of the most visited tourist attractions. The construction of the basilica began in 1882 and is still not finished. It is a beautiful place to visit. It is designed by Antonio Gaudí, a Catalan architect who worked on this project for almost 40 years until his death in 1926. Granada is a city and the capital of the province of Granada. The Alhambra is one of the beautiful parts of this beautiful city. Part fortress, part palace and part garden, the Alhambra is situated on a plateau looking at the city of Granada in the south of Spain. The palace was built in the 14th century by Nasrid sultans. 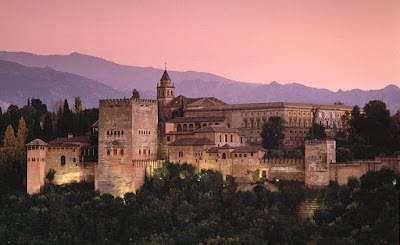 The Alhambra is now one of the largest tourist destinations in Spain and many people visit Granada just to see the Alhambra. The Prado Museum is the best tourist destination in Spain. It is considered the best art museum in the world. It is located in the central part of Madrid. It has one of the finest collections of European art, from the 12th to the early 19th century. It is really a great place to visit as the art on display was purchased by the kings of Spain and includes works by such masters as Goya, Caravaggio, Fra Angelico, Botticelli and Hieronymus Bosh. So do not forget to visit this place at least once.